The farmer I buy my pastured chickens from charges $3.25/lb for a whole chicken. The rancher I buy my pastured beef from charges around $3.80/lb for a butchered, processed, and packaged side of cattle. To some, this seems expensive. Afterall, supermarket sales regularly sell chicken or beef for as little as a dollar per pound. Yet, these are the same people who are willing to pay almost $10/lb for a box of breakfast cereal. Okay, so those $10/lb boxes of cereal are the so-called “organic” or “natural” whole grain granolas and muselei. You can usually find a box of knock-off Honey Nut Cheerios for as little as $4/lb. Cereal grains are usually quite nutritionally empty — particularly when compared to grass-fed beef. Let’s take oats, for example. Oats are one of the most nutritious of all grains, and rolled oats are generally the cornerstone of any self-respecting breakfast granola. On a micro-nutrient level, grass-fed beef wins, too. It’s rich in Omega-3 essential fatty acids, higher in B vitamins, and also contains CLA (the strong cancer-fighting fatty acid only found in grass-fed beef). Plus, the iron in grass-fed beef, being a heme iron, is considerably more usable to our bodies as well. Now consider this: oats are also high in phytic acid. Phytic acid is an anti-nutrient that binds with minerals and vitamins in your gut in order to keep you from fully digesting them. It’s the protection mechanism common to all seeds, grains, nuts, and legumes that helps the seed clear the digestive system of the animal eating it so that we’ll deposit it somewhere else where it can germinate and grow. Granted, our digestive system is particularly acidic when compared to most animals, so we can do a better job digesting seeds than your average chicken. But the point remains: Even though dry oats may contain the nutrients above, there’s no guarantee you’ll be absorbing them all. In fact, you’re guaranteed to have a hard time digesting them. Traditional oat eating cultures hidden away in mountain valleys have one thing in common — they soak their oats in an acidic medium before eating them. It’s how we got old-fashioned porridge — you know, that delightful dish prepared by soaking oats in yogurt overnight before cooking them in the morning. Soaking oats in an acidic medium overnight breaks down the phytic acid in the oats and renders the oats far more digestible to us. So, when you’re walking down the breakfast cereal aisle looking at those $10/lb boxes of organic granola, are those oats properly prepared by soaking before being processed and turned into your favorite cereal? The answer, of course, is no. And as you stray away from the granolas with their added sweeteners and venture into other so-called “whole grain” cereals, you encounter the same problem. None of these grains has been properly prepared either. And, on top of all that, the grain was probably extruded and chemically treated in order to shape it into those cute little rings and tiny little balls and fun little flakes that so delight your children. Taken as a whole, breakfast cereals are a nutritional loss. 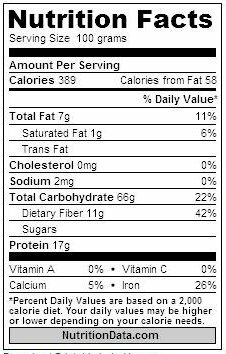 Sugar-laden, carbohydrate heavy, full of artificial ingredients, devoid of natural vitamins and minerals, improperly prepared, and bearing an ingredients label that reads like a college level chemistry course, how can anyone feel good about paying $5-$10/lb for it? But people do. Every day. All the time. And then they complain about the high price of grass-fed beef, pastured poultry, or eggs from pastured hens. This post is part of today’s Real Food Wednesday carnival, hosted by Kelly The Kitchen Kop. Wow – I have to say I wish I lived where you do! My pastured chicken costs $5/lb for whole birds ($10/lb for bone in, skin on breasts) and my grass fed/finished beef costs $6/lb if you buy a quarter cow (about 180 lbs) and significantly more if you buy it piecemeal week to week. The price is definitely a consideration, but I agree that the benefits are more than worth it. Given how I cook and how we eat, our grocery bill is still surprisingly low for a household of four. I like to think that if people really understood the actual costs of their convenience food (i.e. – physical as well as economical) they would be willing to dole out the extra green for Real Food. If you buy simple proteins, organic fruits and veggies and are willing to take the time to make things from scratch, chances are you will see your grocery bills lower over time. Real Food Mama — Ha! I feel the same way whenever I hear about people who live near Amish folks in Kentucky or Tennessee paying a mere $2/gallon for their raw milk from grassfed cows. Raw milk makes up a ridiculous amount of my monthly food budget (along the lines of 20-30%) because I can’t get it for less than $6.50/gallon. And as for the prices I pay, let me just say it was YEARS before I found these sources for this cheap! Every other farmer or rancher in the area charges considerably more, much more like what you’re used to paying. But even then, the point remains. $5/lb of pastured chicken or $5/lb of cereal? The choice is easy, and how could we possibly complain? Good info. We are still pretty new to eating whole/real foods and I am just in the process of figuring out what our budget is for things. In addition to that we live in a new area so I’m also still finding sources. Cereal was one of the first things that we stopped buying. I would rather spend that money on something that is good for our body compared to a box of cereal. Not to mention that my two girls would happily eat an entire box in one sitting and still tell me they are hungry. I have found many replacements to their cold cereal breakfast which actually stick with them until it is time to eat again. I hear from others that they have to feed their family cereal for breakfast because of time issues. I spend maybe 5 minutes cooking up soaked oatmeal in the mornings for them, or boiling broth and adding an egg to it, plus I have a few things that I cook in the crock pot the night before and all we have to do is dish into the bowl. No need for cold cereal here. I am excited about trying yoghurt-soaked porridge instead of just cooking our oats in water. That said – we get raw milk at $9.50 per half-gallon, grass-fed beef starts at $7/lb, and “unmedicated” chicken, which is the best we can get around here, is about $6/lb. We haven’t bought breakfast cereal in ages, but gee! All food around here is so expensive. Hubby read this and said that the argument was flawed because although the price per pound is less for the meat, so are the servings. So, whereas that $3.25 a pound for a whole chicken is pound-for-pound less than the $10 a pound cereal, the chicken doesn’t feed as many people, or as many meals. Back in the gas crisis, people were comparing the price of a gallon of gasoline to a gallon of other items they purchase without complaining about the price. Contact lens drops, for example, run about $375 a gallon (that’s almost four hundred dollars). Pretty expensive for salt water. But, they are used by the drop, not by the gallon so it isn’t a valid comparison. I disagree strongly with hubby’s rebuttal. The meat vs. cereal argument holds, in my book, because hubby will eat a $10 pound of cereal in two sittings alone with no help. I can stretch that $10 chicken for two and sometimes three meals for the seven of us. Serving per serving, I’m getting my money’s worth and more. you offer an important reminder and perspective for real foods vs. industrial foods. however, the nutritional content of oats actually stacks up well, the draw back is clearly how high in carbs oats are but for a kid or person w/high calorie needs this might not be a bad thing. oats apparently have more iron in 100 g vs. meat which i find very surprising. how cn that be? And forget about even cereal, which many people consider healthy, what about all the other crap people have no problem spending their extra cash on like soda, cigarettes, chips and beer? I sit at a farmers’ market now every week collecting fresh food donations for the local food pantry and I’m amazed at how many people will pass me by with a, “sorry, no cash” and then go and buy a cupcake for their 3 year old or a cookie for themselves (these things are like 3$ each). I’m not saying they should have to give to the food pantry, but why are they saying they don’t have money? It’s more important to them to buy junkfood and feed their sugar habit. So I’m sure the same applies to the food issue. Americans just don’t want to spend a lot of money on food because we don’t think it’s a necessity. Great post! This would be great to show folks who are on the fence concerning real food. JC — So true! The only reason I chose cereal as an example was because this morning I slept in and didn’t make breakfast. My husband had to feed our boys, so he went to the store and bought a bag of granola cereal. And I thought, say it ain’t so! Emily — The other drawback about the oats, besides the carbs in our carbohydrate saturated culture, is that they totally lack many of the essential nutrients that the grass-fed beef provides. As to the iron, again, you have to ask what your body can actually use. Our bodies can use 100% of the heme iron found in the beef. The iron found in plants is significantly harder for us to digest. Local Nourishment — I completely agree with you! 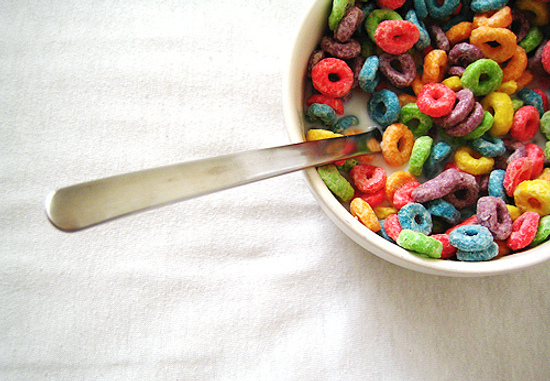 Cereal is not very filling, so you have to eat a lot to get full. Back when we bought cereal, we could finish off one box in one breakfast if we were all eating until we were full. But you can stretch that chicken or beef out across many meals (particularly if you use the bones to make a nutrient-dense broth). Amity — Where do you live? That’s killer. Millie — Right. We missed cereal at first, and I do make up a batch of my Nourishing Traditions friendly cold/hot cereal every few months just to please my kids. But I’m LONG over that now that we eat such filling meals for breakfast. Great article and insightful comments! This topic is being discussed frequently these days. What I keep in mind is that I am voting with my dollars. Grocery store food is cheap because it is paid for with government subsidized dollars that come from our pockets. 60-80% of the food is genetically modifed. Meats are fed on GMO pesticide laden corn and soy, not grass, and confined in horrifically inhumane ways, filled with antibiotics, and rarely see the light of day. Their waste and filth pollute the air and water for miles away. The cost to the environment is hefty. How can we compare that to the life of a chicken, cow, or pig who has never seen the inside of a barn, lives in the sunshine, and dines on grass 12 hours a day? That is the food I purchase directly from my farmer. It is worth whatever I have to pay. I can sacrifice elsewhere. As a country we spent a smaller percentage of our income on food than the rest of the world. We also spend less time cooking, eating, and savoring our food. What a shame. This is a subject near and dear to my heart: I firmly believe that purchasing the best quality ingredients all the time pays off in the long run. Sure, my grass-fed beef might cost $6.50 / lb for the cheap cuts but it’s WORTH it. I might pay upwards of $4.50 / lb for pastured chicken and $8.50 a gallon for raw milk, but it’s WORTH it. What you don’t spend on food, you end up spending on health care. Real food costs real money. Farmers deserve to be paid decent wages for their work, and my family deserves the best nutrition available. Moreover, cost-cutting in the kitchen shouldn’t come from purchasing shoddy foods; rather, it should come from proper kitchen management that doesn’t waste such precious nutrients. Great points you are making here. I agree about cereal completely. Cereal and its healthiness is just a marketing gimmick leftover from the 50s. I grew up thinking that cereal was healthy, but when you think about it cereal is really processed food devoid of nutrition to the point where they have to add it back it. My favorite breakfast is some fresh fruit, blueberries at the moment. Ever since I joined the CSA and supplement with the farmer’s market, and I save a TON of money. The reason: when I got to the grocery store, I stock up on crap like cereal and crackers, processed junk, but at the Farmer’s Market I only have unprocessed healthy options. I feel more healthy than I ever have in my entire life and I am saving money. Its the greatest thing! Thanks for the info on phytic acid, too. Very interesting. Here in Australia, the cost of pastured beef is aroung $12 per kilo (about 2.2 lbs) if you by in bulk (around 20 kgs). Otherwise we pay between $30 per kg for rump/sirloin up to about $40 per kg for eye fillet. And for chicken, about $13 for a 1.5 kg whole chicken. And I still think it’s worth every cent. Intellectually I see the benefit of eating all organic and grass fed, but my wallet is rug burned just thinking about how fast I’d have to pull out money to buy grass fed meat. I get very discouraged looking over grass fed meat prices where I live and at the US Wellness Meats site you recommend on one of your grass fed meat posts. Everyone here says it is so worth it to pay that extra amount but for a frugal buyer (aka cheep) who only buys products when they are on sale thinking about paying 3-4 times more for grass fed makes my stomach do gymnastics. Sure the health benefits are significant but for a healthy family who rarely gets sick despite our “bad eating habits” it is hard to justify the expense. We’ve mostly changed over cleaning and skincare products in our house to natural and organic, but switching the food is a toughy, I’m still a bit shell shocked with the price difference. Earth Friendly Goodies — I understand where you’re coming from, and not all that long ago I was in your boat. It was only AFTER I started buying this way that I realized all the savings! For example, I buy grass-fed beef AND pay considerably less than supermarket prices. Consider that I get EVERY CUT OF MEAT (including steaks, roasts, etc.) for $3.80/lb. While it IS possible to get ground beef for less at the supermarket, I rarely (if ever!) see steaks or roasts for less. So, on the whole, buying this way is saving me hundreds of dollars a year. By buying in bulk, cooking from scratch, and making my own convenience foods rather than buying them, I feed a family of four on less than the federal food stamp allotment for a family my size! And we’re talking about raw milk, grass-fed butters and cheeses, grass-fed/pastured/wild animal meats, quality fats & oils, etc. My point is that if you are determined, you will probably be able to find a way to eat frugally while eating well. For us, we place the priority on eating grass-fed/pastured dairy & meats and try to buy organic for the rest when we are able. I have quite a few posts in the Food Savings category. Would you consider checking those out? Walter — I didn’t mean to imply that other pastured meats aren’t also higher in Omega 3s and other good vitamins and nutrients when compared to their feedlot counterparts. I was simply comparing the nutrient density of grassfed beef to cereal. That’s why the other meats were omitted. I do believe, though, that the only significant sources of CLA are in the meat, milk, and cheese made from pastured cows and other ruminants. I think that’s because the amount of CLA in the fat is a direct result of eating grass, and cows, by nature, eat A LOT of grass when compared to chickens or hogs. Of course, if those animals are pastured, they too will have CLA in their fat, but simply not enough to be truly significant since usually their diets are supplemented with all kinds of other stuff besides grass (particularly in the case of hogs). What a great post, Kristin. Thanks for breaking it down in an easy to digest (!) way. You make a great point in the post and in your comments. Buying in bulk, eating the whole animal, and cooking more are great ways to eat better and save money. Thank you!